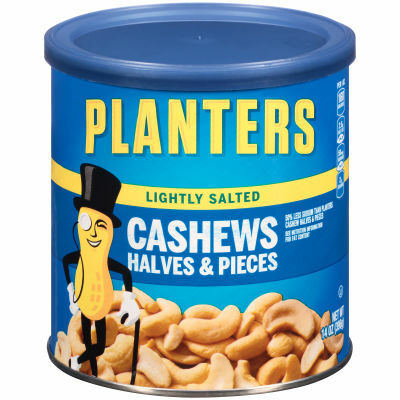 Planters Lightly Salted Cashew Halves & Pieces delivers that quality nut flavor you've grown to trust with 50% less sodium than regular salted cashews. Each cashew is carefully picked and then lightly seasoned with sea salt to enhance the natural goodness of each piece. Available in a large resealable 14 oz. canister, this lightly salted cashew mixture will stay fresh between snacking. Pre-crushed for added convenience, these cashew halves and pieces will also make a great addition to your cooking and baking. Serving size 1oz (28g/about 50 pieces).